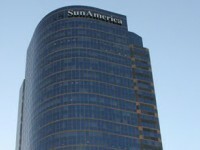 This impressive office building known as the SunAmerica Center is home to our 11th floor business center. This new Century City building was a California winner of BOMA International's "The Office Building of the Year (TOBY)" award! Right beside the upscale Westfield Century City shopping center, offering access to fine restaurants, cafes, shops and theatre. You can enjoy outstanding views of the Pacific Ocean, Santa Monica Mountains, the Hollywood Hills and downtown from your new office. This address is also very convenient to the 10 & 405 Freeway.